Is Mose Allison a bluesman or a jazzman? If you have listened to any of Allison's recordings, you quickly realize that this is a question that defies answering. The latest recording, Gimcracks & Gewgaws, is no different. The fourteen song CD offers tastes of both jazz and blues, all presented in Allison's distinctive style. Gimcracks & Gewgaws offers an entertaining addition to Allison's repertoire that includes more than 150 original tunes, performed all over the world, averaging over 150 performances per year. Ably assisted by Paul Motian (drums), Ratzo Harris (bass), Mark Shim (tenor saxophone) and Russell Malone (guitar); Mose Allison takes his listeners on a ride that includes jazz, blues, boogie and his unique vocals, with lyrics chockful of hooks and observation on life. Gimcracks & Gewgaws is produced by Ben Sidran and the recording displays his influence on more than one occasion both vocally and in musical style. Opening with a song entitled, "MJA, Jr.," Mose starts with a autobiographical tune with a clear jazz influence. 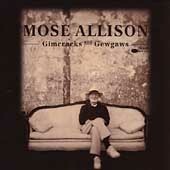 The title tune, "Gimcracks & Gewgaws," is typical Allison, offering funky sounds and tongue-in-cheek commentary. The jazzy feel of the recording continues through to the fifth song, "St. Louis Blues." "St. Louis Blues" sees Mose and company take the significant turn to the blues, offering a nice guitar solo by Russell Malone. This is followed by another blues influenced tune called, "Mockingbird". Midway through the CD, Allison offers a song called "The More You Get," a nice jump blues tune that includes nice solos by Malone on guitar, followed by Allison on piano. Allison turns somewhat "lounge-piano crooner" on "Texanna," a lament of lost love and opportunities. "What Will It Be" brings the CD back to a jazzier feeling again, featuring extended guitar and piano solos by Motian and Allison. "Somebody Gonna Have To Move" features lyrics by Allison that are as pointed and ornery as ever. "Fires of Spring" offers an interesting wavelike piano and is a great tune, hard to classify in any category. The grand finale of the CD, "Old Man Blues," is a brief but pointed reworking of Allison's "Young Man Blues" (made most famous by The Who's deafening cover version). The sequel, "Old Man Blues," offers a view from the old man's side of the fence; suggesting that the "old man he's got nothin', where the young man wheels and deals." Mose Allison is a musical giant, regardless of how anyone chooses to classify him and his music. With over 25 albums to his credit, Gimcracks & Gewgaws represents another feather in Allison's cap and another reason to be glad that, at age 70, he has chosen to continue to grace us all with his fine musical talent. Copyright © 1997, 1998 Ray M. Stiles. All rights reserved.